​Technical workers--analytical, engineering, mathematical, research and development, scientific, and technology employees--look for different things from their employers. Understanding these differences is essential for attracting and retaining these workers who are highly sought after, but in short supply. IBM was among five best-practice organizations studied in APQC's 2011 Collaborative Benchmarking study Technical Talent Management. 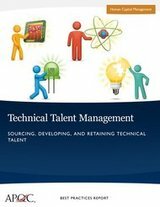 This case study describes how IBM effectively manages technical talent across the employment life cycle. Click here to read the full best practices report.